There has been a lot going on at our house lately. So please forgive me for not keeping my normal blogging schedule. Hopefully as things settle and cool down I can get back into the groove of things. We are currently trying a gluten-free diet at our house and it has turned my kitchen as well as my world upside down. 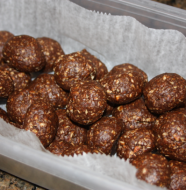 While this recipe is not gluten-free, if we have to keep a gluten free diet at our house it will be high on the list of items to try to recreate in a gluten-free manner. 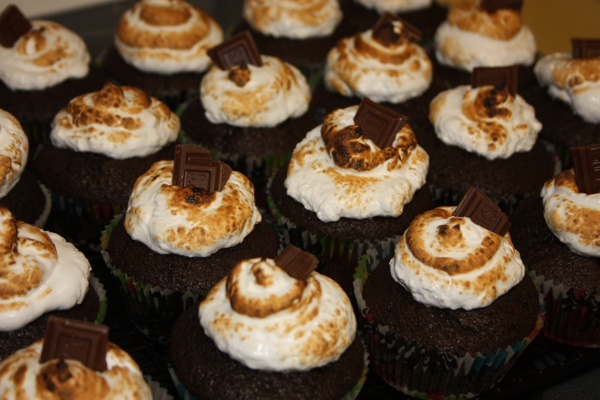 I made these cupcakes (or Jeffrey and I made these cupcakes) a couple of weeks ago for a family gathering and unfortunately the cupcakes and Tyler made it to the gathering, but Jeffrey, William, and I did not. Let’s just say All-City dive meets take awhile. 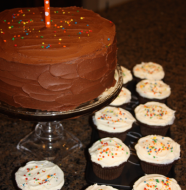 Since I wasn’t there I can’t say what the first reactions were, though the family members in my house all enjoyed them and I did have several family members mention their approval of the cupcakes after the fact. 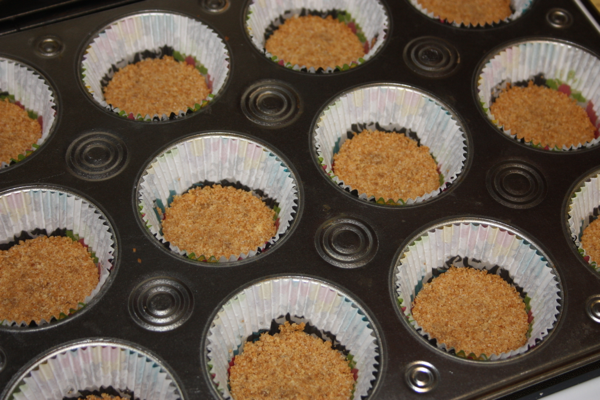 Preheat the oven to 350° F. Line two cupcake pans with paper liners. In a small mixing bowl, combine the graham cracker crumbs, sugar and melted butter; mix well with a fork. 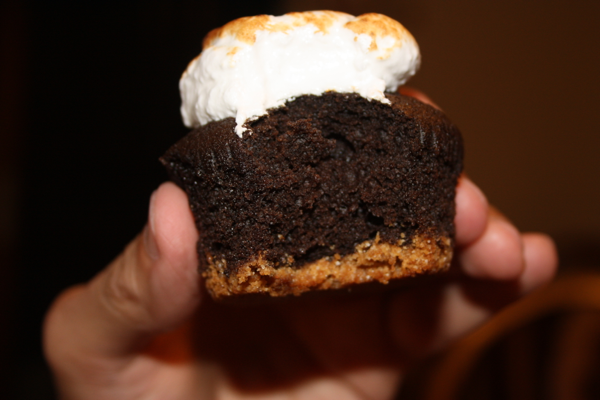 Drop about 1 tablespoon of the graham cracker mixture in the bottom of each cupcake liner and press down to line the bottom. (Note: The bottom of a small cup or bottle works well here.) Bake for 5 minutes. Remove from the oven, and maintain the oven temperature. In a small bowl, combine the cocoa powder and hot water and whisk until smooth. In another medium bowl combine the flour, baking soda, baking powder, and salt, and whisk to blend. Combine the butter and sugar in a medium saucepan set over medium heat. Cook, stirring occasionally, until the mixture is smooth and the butter is completely melted. Transfer the mixture to the bowl of an electric mixer and beat on medium-low speed until the mixture is cool, about 4-5 minutes. Add the eggs one at a time, mixing well after each addition and scraping down the sides of the bowl as needed. 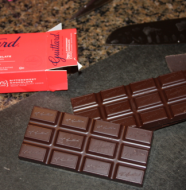 Blend in the vanilla and then the cocoa mixture until smooth. With the mixer on low speed, add the flour mixture in three additions alternating with the sour cream, beginning and ending with the dry ingredients and mixing each addition just until incorporated. Divide the batter evenly between the prepared liners, filling each about ¾-full. Bake until a toothpick inserted in the center comes out clean, about 15-18 minutes. Let cool in the pan about 5-10 minutes, then transfer to a wire rack to cool completely. To make the frosting, combine the egg whites, sugar and cream of tartar in a double boiler or bowl set over a pan of a few inches of simmering water. Mix with a hand mixer for 7 minutes while over the simmering water. 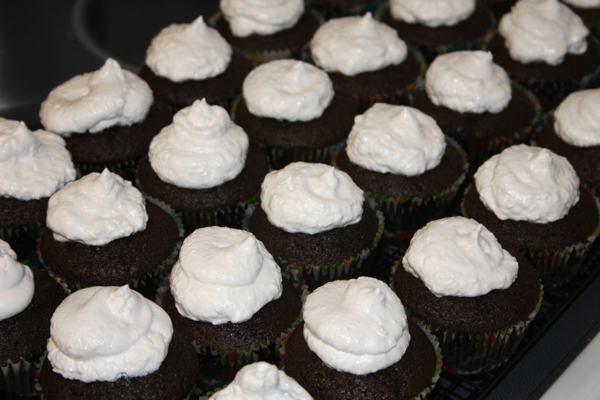 The frosting will become glossy and form stiff peaks. Transfer the frosting to a pastry bag fitted with a decorative tip. 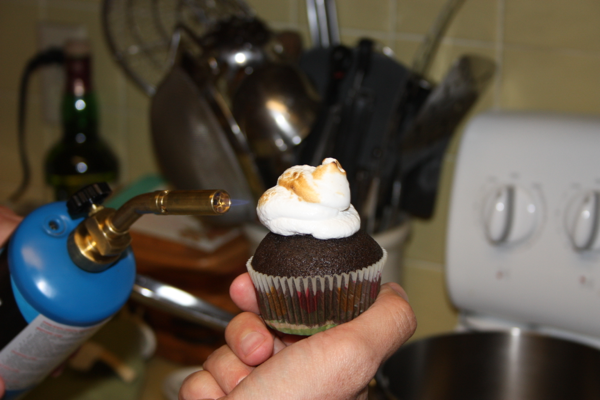 Pipe onto cupcakes and then brown with a torch and garnish with chocolate pieces if desired. Graham cracker crusts for the bottom layer of the cupcakes. 7 minute frosting piped on top to resemble marshmallows. 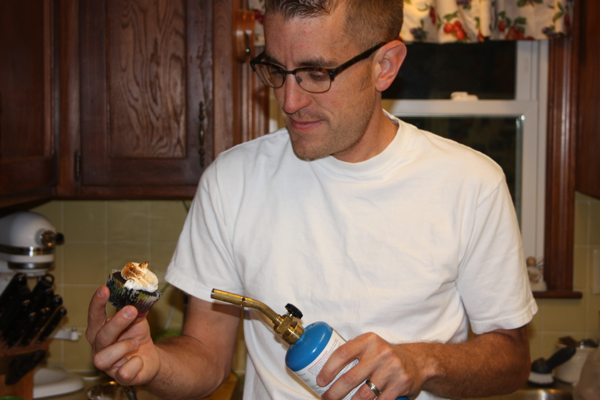 Torching the cupcake. Be careful and have a fire extinguisher handy. All the different layers for one scrumptious cupcake. 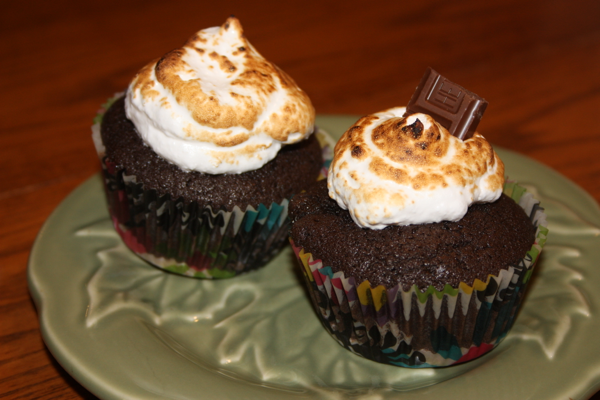 3 Comments on "S’mores Cupcakes"
I thought these were delicious cupcakes. If I didn’t tell you before we LOVED these! The graham cracker crust was my favorite too!